The Epcot International Festival of the Arts, which is currently spreading color and fun through February 19th, is officially in full swing. If you haven’t heard of the Epcot International Festival of the Arts before, that’s not surprising – it is a fairly new event at Epcot, returning only for its second year. But don’t let the newbie status fool you; this event is just as fancy and amazing as its older siblings, the Epcot Food & Wine Festival and the Epcot International Flower & Garden Festival. 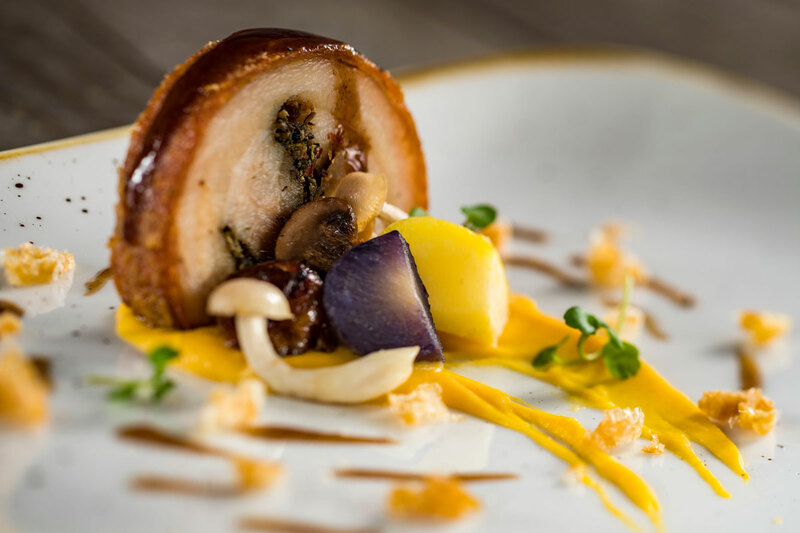 In fact, I would argue that the Epcot International Festival of the Arts combines the best of both worlds – it offers the beauty of the Flower & Garden Festival with the serious gastronomical goodness of Food & Wine. There are several workshops and seminars offered daily throughout the Festival. Interested in learning about how to take great pictures of fireworks? No problem! Experts from the Disney Photo Imaging team will present their best tips and tricks. Or do you want to know more about how Walt Disney World store designers blend the science of store planning with the art of retail design so that we spend more money we have an even better experience? There’s a seminar for that too! From learning how to draw Mickey to molding your own teapot to creating your own canvas painting, there are so many activities to choose from! For a full listing of all the scheduled workshops and seminars, click here. Seminars can be reserved same-day at the Odyssey Festival Center or in advance through (407) WDW-TOUR. This year’s Festival scavenger hunt, Figment’s Brush with the Masters, is a great way to make your way around the World Showcase. You start with a map of the World Showcase (which you can purchase at Pin Central, Disney Traders, or World Traveler) with 11 blank squares and 11 stickers of paintings. Your task is to then find which painting corresponds with each country – and place that sticker on your map. What makes the scavenger hunt even more fun is that you can find Figment cleverly incorporated into the paintings! And when you’re all done – you can pick up a limited edition pin as your prize. Disney always does a great job with fun PhotoPass opportunities (magic shots, anyone?) 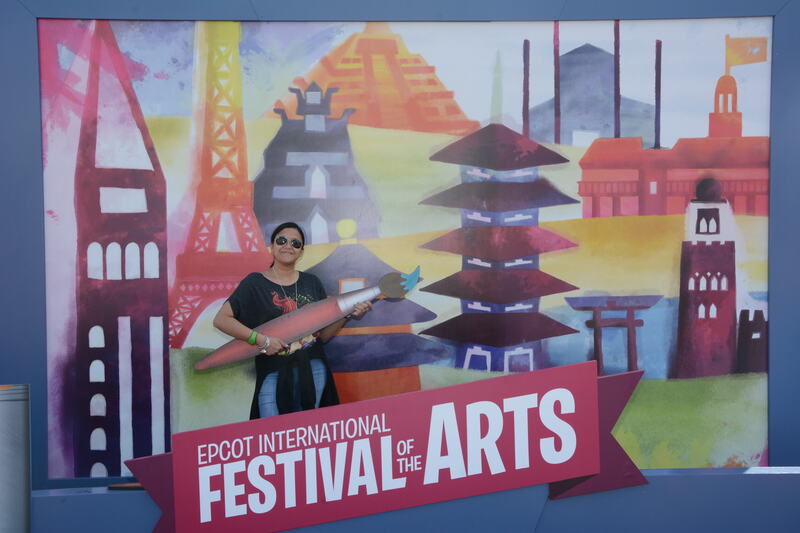 – but what Disney has offered for the Epcot International Festival of the Arts is just a genius blend of PhotoPass and, well, art! As you walk around the World Showcase, you will find different frames that you can step into, thus allowing yourself to be part of iconic pieces of art! 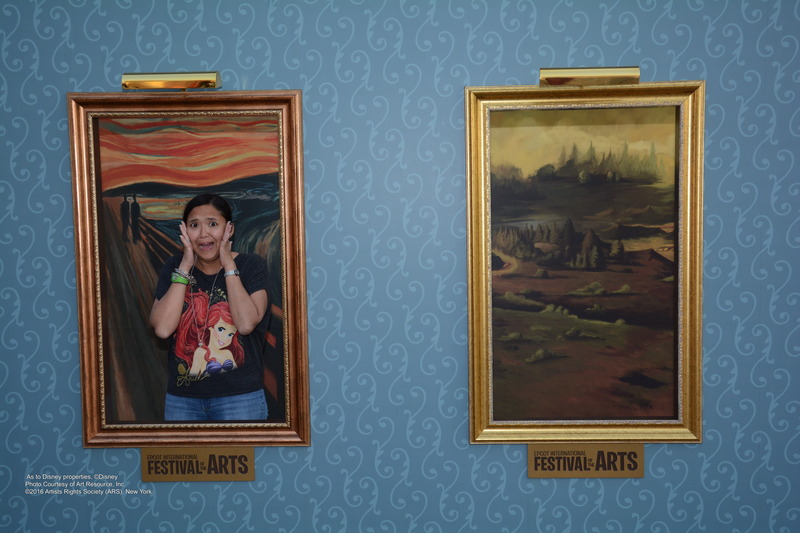 My picture from last year’s festival, which is an homage to Edvard Munch’s The Scream, may be one of my most favorite PhotoPass pictures ever. It’s just so fun and creative! For this year, don’t miss the new additions of Boticelli’s “Birth of Venus” and Frida Kahlo. Every Disney fan knows that with every Festival comes some amazing food! And because we’re talking about a festival dedicated to art, the food delivers in this department as well. Disney is not just serving you any regular pop tart for example – they are serving Pop’t Art cookie with strawberry filling, designed like the pastry chef was inspired by Jackson Pollock himself. You also can’t miss the Almond Frangipane Cake layered with Raspberry Jam and Chocolate, which will remind you of a stained glass window. You’re going to be tempted not too eat it because it is just that pretty – but you’ll find it tastes every bit as good as it looks. The Epcot Food & Wine Festival has the Eat to the Beat Concert Series, and the Epcot International Flower and Garden Festival has the Garden Rocks Concert Series. Not to be outdone, the Epcot International Festival of the Arts features Broadway stars who have played leading roles in Disney musicals. Some of this year’s featured artists? There’s Ashley Brown, who played Mary Poppins herself on Broadway, as well as Belle in Beauty and the Beast. Other featured artists also include Josh Strickland, who played Tarzan; Kissy Simmons, who played Nala in The Lion King; and Alton Fitzgerald White, who played King Mufasa for more than 4,000 performances in The Lion King on Broadway. And that’s just to name a few! With their soaring voices and stirring scores, this concert series is truly something you can’t miss – it’s like a mini-Broadway show! Performances are held at the America Gardens Theatre, Fridays through Mondays of the Festival, at 5:30 pm, 6:45 pm, and 8:00 pm. And with that, let me turn it over to you: what are you looking forward to the most at this year’s Epcot International Festival of the Arts? Which Disney on Broadway Concert Series performer will you line up for? Sound off in the comments below! 2018 is a great time to visit Walt Disney World! With events like the Epcot International Festival of the Arts and the upcoming Epcot International Flower & Garden Festival, there is just so much to see and do. If you are thinking about planning a vacation to Disney, contact me at myra@worldofmagictravel.com or (920) 526-0809. As the resident travel agent for Guide2WDW, it is my job to make sure you get a great deal when you travel and also give you the latest tips and tricks to make the most out of your vacation! Contact me for a FREE quote today!